Maxim Alterman of BC came in 30th of 326 entries. Portland’s irrepressible Pok Kim took 23rd, with Hombre Perez of WA in 20th, Jenifer Lindsey of OR in 65th, Bradley Delamere (ID) in 69th, and Johnathon Baker of WA at 93rd. Matt Affleck (WA) started the day near the top and stayed there, finishing 6th on the final table. The field was literally decimated on Day 2, going from 278 players to just 26. Zachary Humphrey (WA) is the last PNW player, currently in 19th place in chips. Brian Egger just missed Day 3, going out in 29th. Tony Golden (WA) got his first WSOP cash in 191st, but since he didn’t make the final table, I guess I’m not getting that free flight to Vegas…. Oregon’s Dan Martin leads the way for PNW players in 14th place of the 309 returning. 2,155 players entered, 216 make it to the prize pool of $2.9M. Registration is open until the beginning of Day 2, but 166 players took a stab at this new event and—depending on which part of the report you read—there are either 67 or 70 coming back with 18 making the money, most likely. The EOD1 report says there are 67, with WA’s Scott Clements in 2nd and Yevgeniy Timoshenko (also WA) in 55th. Edmund Chan (BC) is the only other PNW player, at 54th. The Venetian finally reposted these results from the 24th with the hometown info, and in 8th place for $8.7K was Tigard, Oregon’s John White, who I believe is the same John White in the Day 2 runners for WSOP Event #59 (above). Reginald Caymol of Seattle got 35th and Enrique Villacres of Renton, WA took 67th. Total prize pool was $286,600. Make it to the money in the Survivor tournament and you get $2.5K. 174 players took the challenge, meaning there were 17 full prizes and $1.7 left over for 18th place. Jay Chung of WA got the full prize, and Stacey Wolf of OR chopped 18th place with Iury Wolf of Israel (presumably no relation). Binon’s seems to have pretty much given up on winner reports. Nearly $40K in overlay in this final event one-day $200K event of the series. Arvhin Malinab of Vancouver, BC got 14th, and James Lim (also BC) got 52nd as the only two PNW reps in the event. The first day’s results from two flights are in, and Arif Bhaloo of BC is through to Day 2. Jennifer Assu of BC got a good return on her buy-in, making 6th place out of 431 entries. BC’s Jacqueline Ray got as high as 14th, with Lorraine Boe (BC) taking 34th. Mark Hughes of BC placed 74th of 1,602 entries, with Nam Nguyen (WA) in 59th and Laurence Hughes (WA) in 100th. The $1,111 Little One for One Drop has two flights today at the WSOP. Tomorrow is the $1.5K NLHE Bounty tournament, where each knockout is worth $500. And there’s the $10K HORSE that I should be playing but I’m not. At the Venetian, there’s a final starting flight ($600 entry) at noon for a $250K guarantee NLHE tournament. This evening is the first of two $1.1K PLO flights ($150K guarantee). Tomorrow is the first flight for the $500K guarantee NLHE with $1.1K entry. Planet Hollywood has a second day of entries for the $100K guarantee ($300), and a $5K guarantee NLHE Turbo tournament for $130 at 2pm. Aria is running twice-daily $125 satellites to the $2M guarantee Main Event that starts Thursday. The Wynn Summer Classic kicks off a $250K NLHE with $600 flights today and tomorrow. The Grand Poker Series has the first of three flights for their $500K guarantee Main Event, with a $560 entry. Binion’s Poker Classic has a $10K guarantee HORSE game ($220) with a $160 entry $10K NLHE tomorrow. This event wrapped up on Day 3. On the Day 1 and Day 2 reports, Parminderjit Mehmi was listed with a hometown of Vancouver, British Columbia but on her cashout she apparently listed herself as being from Tampa, Florida, which isn’t even NW Florida, but doesn’t have an income tax. She placed fifth, wherever she’s from. WA’s Steven Marx picks up his first WSOP cash in ten years, after placing 35th in the Main Event for a quarter million dollars the year Joe Hachem won. Marx missed hitting a flush after the flop and went out in 19th. 28 players are coming back on Day 3, and Matt Affleck (WA) is fourth in chips as the only remaining PNW player. Portland’s Kheang Tang was among the highest PNW finishers of the day, at 38th. Coeur d’Alene, Idaho resident Kevin MacPhee is the latest PNW player to bring home a bracelet, after a long Day 2. It’s MacPhee’s fifth cash at the WSOP this year, but his first-ever win (he was close just three weeks ago). Lee Markholt (WA) and Shawn Buchanan (BC) were the other two PNW playersa in Day 2; they placed 18th and 34th, respectively. It’s going to be a sad Day 2 for eight players coming back this afternoon. Out of 278 players left, there are nearly 30 returning to stacks of less than 10BB, and only 270 players get paid. Three of the 14 PNW players are in that red zone. Higher up the ladder, OR’s Kenn Pluard is right behind 2014 Main Event champion Martin Jacobson, in 75th. Just kidding. No PNW players. At least none in the 46 making Day 2. 135 players entered. Today’s WSOP schedule is a $1.5K NLHE game and the $25K PLO 8-Max. Tomorrow is the $1,111 Little One for One Drop, with two flights and re-entry. At the Venetian, There are starting flights today and tomorrow ($600 entry) at noon for a $250K guarantee NLHE tournament. This evening is the second flight for the $100K Omaha 8 game ($600). Tomorrow evening is the first of two flights of a $150K PLO tournament. Planet Hollywood starts the final $100K guarantee ($300 flights morning and afternoon on Monday and Tuesday), and a $5K guarantee PLO tournament for $150 at 2pm. The Wynn Summer Classic has $300 NLHE with $25K guarantee today. Tomorrow is the first of two $600 flights to the $150K NLHE. The Grand Poker Series has a $560 Stud8/Omaha8 game and a $150 NLHE tournament. Tuesday is the first of three flights for their $500K guarantee Main Event, with a $560 entry. Binion’s Poker Classic has a $10K guarantee $160 NLHE game today and a $10K HORSE game ($220) tomorrow. Woodinville, Washington’s Rep Porter took 19th place, making his fifth cash this year and a pretty decent argument why you might want to sign up for the Poker Academy he runs. Two players are left coming back for extended play on Day 4. Washington’s Scott Clements ran into a flopped flush in a hand of PLO8, and went out in 8th place. Parminderjit Mehmi of Vancouver, BC is a very close 2nd in chips at the unofficial final table going into Day 3. Cashing on Day 2 were Yian Saelee (WA, 36th), Marie Jespersen (BC, 43), Susan Sowards (OR, 52), and Mandy Jimmie (BC, 79). Charles Coultas (WA) placed 35th. There are 21 players remaining, with only one from the Northwest: Bellvue, Washington’s Steven Marx, who’s currently in 18th position. This new event got 1,123 entries, with 562 of them making the money. Sort of. 281 players received $1K, giving them a WSOP payout but still $500 in the hole. Another 164 made $1.5K, breaking even. Day 1 saw all of the lowest payout tier make the money, with 70 of the second tier gone, as well. 211 come back for Day 2, with 8 PNW players still in play. Sixteen Northwest entrants cashed in the $1K tier (positions 282 and higher), and another four have already collected $1,5 in the second tier. 454 entries played down to the bubble on Day 1, after eleven hours of play and 19 30-minute levels. 54 players are coming back for Day 2—with 40-minute levels—including Shawn Buchanan (BC, 30th position), Lee Markholt (WA, 13th), and Kevin MacPhee (ID, 8th). Daily Deepstacks results for 6/26 haven’t been posted as of 8:40am on the 28th. Results for the 26th and 27th came through just after I posted around 10am. Cathy Irwin of BC got 11th place of 148 entries. 276 entries. Timothy Goble placed 18th. 877 entries. Bhagvant Khalsa of Oregon got 28th, Angie McCranie of WA took 30th. Parminder Kumar and Vincent Sperrazza, both of Washington, came in 65th and 76th, with Daniel Davies of BC squeaking in past the bubble at 90th. Louis Piccioni, Jr. of Idaho got to 10th in the field of 130. Ronald Southwick of Oregon took 12th. Robert Mitchell of Bend, OR made five figures, placing 4th in the field of 953. Nathan Chow of BC got 16th and Charles Mast of OR made 21st. As if the first three tables weren’t enough for the PNW, Stacey Vaughn (also of Bend) just missed out, going out in 28th. Then we missed a few tables, before Michael McSpadden (OR), who finished 91st. The Venetian left hometown (and other) info off of their report for Event #47, a $200K guarantee that—from the size of first price ($74K)—looks as if it may have been over, but they haven’t updated things for a few days, either. Binion’s hasn’t posted results all week. The Wynn reports are usually just full of Nevada grinders, so it was nice to see Oregon’s James Hart and Washington’s Glenn Stock made the final table to take 7th and 8th in a field of 163. There are 210 returnees to the $1M event after three starting flights. Portland player Steven Harper is in the middle of the pack at 102nd position and the only representative from Oregon. Laurence Hughes (70) and Nam Nguyen (96) are Washington’s contributions. Mark Daniel Hughes (92) and Adam Toovey (161) make up the BC Day 1 survivors. No official publication on the prize pool, but estimates near the end of registration on the final day put it at $1.6M, with $250K going to first place. 112 women are returning for Day 2 of the LIPS event, with five from British Columbia and one from Oregon representing the PNW. Gail Hand of Seaside is the lone player from Oregon, in 79th place. April Falley and Persia Bonella are in 12th and 18th place, with Jenn Assu in 55th, Jennifer Tokarek in 77th, and Lorraine Boe in 84th rounding out the BC contingent. At the WSOP it’s a no-gimmick $1K NLHE—no short levels, no long levels, no weird payout structures. Just some poker. The $111,111 High Roller for One Drop starts at 1pm. Tomorrow is a $1.5K NLHE game and the $25K PLO 8-Max. Tuesday is the $1,111 Little One for One Drop, with two flights and re-entry. At the Venetian, There are starting flights today and tomorrow at noon for a $250K guarantee NLHE tournament and at 5pm for $100K Omaha 8/B. Both events are $600 entries. Planet Hollywood ‘s only event is a $400 buy-in $200K guarantee that plays out in one day. Tomorrow is the beginning of the final $100K guarantee ($300 flights morning and afternoon on Monday and Tuesday), and a $5K guarantee PLO tournament for $150. Aria has a $135 Ladies Survivor tournament at 11am and a $150 NLHE game at 7pm. Beginning tomorrow, they run twice-daily $125 satellites to the $2M guarantee Main Event that starts Thursday. The Wynn Summer Classic has $300 NLHE with $25K guarantees today and tomorrow. The Hollywood Poker Open (M Resort) winds down action as the big event goes on with a $235 NLHE tournament at 1pm. The Grand Poker Series has the final $350 entry $100K guarantee tournament. Tomorrow is a $560 Stud8/Omaha8 game and a $150 NLHE tournament. Tuesday is the first of three flights for their $500K guarantee Main Event, with a $560 entry. Binion’s Poker Classic has a $10K guarantee $160 NLHE game today and tomorrow. Normally, I lead with WSOP reports, but all congratulations to Dan Butcher of Portland—the man who taught me that queen-ten was the nuts at Portland Players Club (back when he still deigned to play NLHE) and self-acknowledged King of Big O—for winning the 133-entry Big O tournament at the Golden Nugget. Taking third place was M. Tucker of Washington. Matthew Yurkewecz of Portland came in 13th. Douglas Carr of BC cashed in second place out of 857 entries, with Michael Pollowitz of WA also making the final table at sixth. Ivan Pearson (OR) placed 34th, with Daniel Posey (ID) coming in 39th. Laszlo Somogyi and Dong Guo (both BC), and Christopher Hogue (WA) finished out the PNW cashers in 78th, 86th, and 90th. Christine Lester and Wai Lim, both of Washington, placed 7th and 8th. Cornelius Manu of Oregon was the only PNW player to make the money, placing 8th of 236 entries. 872 entered, making a prize pool of $166K. Anthony Golden (WA) took 3rd for $14.7K and was the only PNW player to make the money. A chart of the Daily Deepstacks prize pools is here. Portlander Joseph Haddad made the official final table of the PLO8, surviving getting quartered by George Danzer and Conor Drinan to outlast the likes of Vanessa Selbst and Erik Seidel. Coming into Day 3, Ian Johns of Washington had 21K left, with the blinds at 6K/12K and limits at 12K/24K. Not even a single big bet. But he doubled on the second hand of the day, which put him in a position to outlast Brian Tate, who started with only 70K. In the end, he got the same amount of money for 10th, but makes his fifth and largest cash of the series. Terence Chan (BC), the co-host of the 2+2 PokerCast, is the first player to be eliminated from the official final table, after his kings are brutally cracked when he and Ben Yu (the winner of the event) are all-in after the flop and Yu catches a river gut-shot to make a straight. 6-Max is a volatile format, and while 13 PNW players started the day, with Gareth Struivig De Groot (BC) leading the group in 13th place overall, only three cashed on Day 2, and De Groot just made the money at 103rd. Rep Porter (WA) is the sole PNW player remaining in the 35 coming back for Day 3; he’ll be making his fifth cash of the series in this event. Kevin MacPhee (ID) cashed in 18th place; Shane Abbot (WA) took 22nd. Scott Clements is the last player remaining in a field of 11, as Robert Mizrachi attempts to win this event again. I still think the innovative way the WSOP addressed the issue of jerks entering the Ladies tournament—by giving women a $9K discount—deserves a laugh or two. Guys entering the tournament was like a guy demanding discount drinks at a bar’s Ladies Night: the whole point is to draw women in and expand the customer base, not to give them something special because they’re women. If there was a desperate need to increase the number of customers who are jerks, there’d be Jerk Night at bars or a Jerks tournament at the WSOP. Enough soapbox. Seven women from the Northwest made it through Day 1 of this event. 121 players are coming back, but only 81 get paid. More than half the players are from British Columbia: Mandy Jimmie (20th), Parminderjit Mehmi (34th), Marie Jespersen (45), and Wing Chan (53rd). Yian Saelee (59th) and Rita Keizer (94th) are from Washington. Susan Sowards (40th) is the long Oregonian. Not a lot of PNW players in Day 2 (though there were plenty of PNW dealers at the tables. Steven Marx (34), Yevgeniy Timoshenko (103), Charles Coultas (110), and Noah Bronstein (111) were those making it from Washington. And Michael Baxter of British Columbia is in 39th. There are 134 players remaining; 40 get to the money. At the WSOP today it’s the start of the $1.5K DraftKings NLHE. A quarter of the players get paid $1K (losing only $500), another 15% make their buy-in back, and the rest of the prize pool gets paid out on the normal schedule. The evening game is the $5K NLHE Turbo. Tomorrow is a $1K NLHE, followed by the $111,111 Big One for One Drop High Roller. It’s the final $1.6K flight in the Venetian $500K NLHE. No evening event today. Tomorrow is the first of three days of entry flights for the a $250K guarantee with $600 buy-in, and the first of two $600 flights in the $100K guarantee Omaha Hi-Lo tournament. Planet Hollywood runs the last flight to the $1M guarantee $1,150 NLHE tournament. This afternoon is their $250 LIPS National Championship, but the time has been pushed back to 3pm. Tomorrow’s only event is a $400 buy-in $200K guarantee that plays out in one day. Aria has a $235 NLHE game at 1pm and a $150 NLHE at 7pm. There’s a $135 Ladies Survivor tournament tomorrow at 1pm, and the usual $150 NLHE at 7pm. The Wynn Summer Classic has $300 NLHE with $25K guarantees today through Monday. A t the Hollywood Poker Open (M Resort) a $125 Turbo satellite to the 1pm $555 Seniors tournament has already started. There’s a $235 NLHE game tonight at 6pm and another tomorrow at 1pm. The Grand Poker Series is running their $240 Ladies tournament and a $350 NLHE Bounty ($100 per knockout). Tomorrow is the beginning of the final $350 entry $100K guarantee tournament. Binion’s Poker Classic has a $10K guarantee $160 NLHE game every day through Monday. Kyle Zartman picked up his second WSOP cash in just over two weeks, going out early in the day at 39th. This event will run into a fourth day, with five players returning. Seventy players came back to day 2 who weren’t going to cash in the top 90, but only four PLW players fell before the money bubble. Nine cashed on Day 2, and Portland’s Joseph Haddad is still in the running for a bracelet, as one of the 21 players coming back for Day 3, after doubling up in a crucial all-in preflop hand against John Monette. Terrence Chan (BC) is 7th of 11 players remaining in this contest. With 241K, he’s near the median chip stack, though that’s different in a limit game. In 11th place, Washington’s Ian Johns has one big bet remaining. Gareth Struivig De Groot already cashed in one 6-Max event this year, and he leads the pack of PNW players (along with two other British Columbians) going into Day 2 in 13th place in this event. 285 of 1,043 entrants made it through Day 1, 108 make the money. Only 357 players entered the tournament, down 60 from its inaugural last year when Robert Mizrachi won. PNW players among the 75 coming back to Day 2: Scott Clements (WA, 5th), Shane Abbott (WA, 13th), Greg Mueller (BC, 14th), Kevin MacPhee (ID, 30th), and Dustin Leary (WA, 49th). 36 players get paid. Portland’s Noah Olinsky squeaked into the money at 16th of 159 entrants; the guarantee was busted like a Big O hand with two aces, making it to $83K. Brian Snyder (OR) got to 11th, and Bill Walker of Ashland, OR took 3rd. Oregon is Big O country! Mark Daniel Hughes (BC) finished the first flight of the $1M Main Event in the middle of the chip stacks. There are flights today and Saturday, with the three flights combining on Sunday. Julie Freer (WA) won one of the 35 $1,250 Ladies International Poker Series National Championship prizes, which includes a buy-in for today’s WSOP Ladies event and the LIPS championship on Saturday. Another prize pool busted: $23.4K from 201 entries. The only PNW casher was Andrew Vaughn, in 21st place. David Robinson (WA) and John Kehler (BC) were among 16 players who won $1,150 seats into the PHamous Poker Series Main Event, making them eligible to enter flights today or tomorrow. It’s Ladies Weekend in Vegas and the WSOPis no exception, with their $1K Ladies event at noon. It’s $$10K PLO 8-Max this afternoon, so if you can’t leave the Rio, you’re not a woman, and you don’t have $10K (which it will cost you if you’re a guy entering the Ladies tournament), then you best play cash. Or take the day off and enjoy railing your gal. Tomorrow is the $1.5K DraftKings NLHE. A quarter of the players get paid $1K (losing only $500), another 15% make their buy-in back, and the rest of the prize pool gets paid out on the normal schedule. The evening game tomorrow is the $5K NLHE Turbo. Sunday is another chance at a standard $1K NLHE. It’s the second of three $1.6K flights in the Venetian $500K NLHE. There’s a $300 $20K guarantee NLHE Survivor tonight. Tomorrow is the last flight for the $500k; no evening event. Planet Hollywood runs a flight to the $1M guarantee $1,150 NLHE tournament. This afternoon is a $200 satellite to the last flight tomorrow. Aria has a $235 NLHE game at 1pm and a $150 NLHE at 7pm. Same tomorrow. A turbo $235 satellite to the $500K guarantee Main Event at the Hollywood Poker Open (M Resort) is at 10am. The Main Event starts at noon. Tomorrow is the $555 Seniors tournament, with a 10am turbo feeding into it ($125) at 10am, and a $235 NLHE tournament in the evening. The Grand Poker Series is running one of their $350 NLHE with $100K guarantee. Tomorrow is their $240 Ladies tournament and a $350 NLHE Bounty ($100 per knockout). Shawn Buchanan of British Columbia took 8th place in this prestigious event, navigating through the 10-game mix to 8th place and $139K in prize money. The final 6 play it out today. The indomitable Tyler Patters0n of Washington State made it through over 1.6K players to the final two tables for 18th place and $15K. Today, the last two battle for the bracelet. Dan Idema of BC picked up $53K for 6th place, eliminated on the first hand of the official final table. Four players are coming back for Day 4 after a long standoff. Chad Wassmuth of Idaho was the only PNW player to cash in this event on Day 2; it’s his fourth cash of of the series and he’s more than quadrupled his earnings from previous WSOP and WSOP Circuit events. Oregon’s Kyle Zartman is 31st among the 41 players returning for Day 3. If he can place higher than 27th, it will be his largest WSOP cash to date. Kent Novick of WA cashed in 35th place. The event is at the final table today with no PNW players remaining. It’s unusual that you see three names from a state with as small a population as Idaho in a list of 162 poker players, but the PLO8 brought them out. Washington’s Scott Clements is in the top 5 overall, ahead of the rest of the sizable contingent of PNW players coming back for Day 2. 90 make the money. 117 elites entered for the chance at 18 paying spots. 74 are left going into Day 2, including these PNW players: Ian Johns (WA, 14th), Daniel Idema (BC, 15), Shane Douglas (ID, 56), and Terrence Chan (BC, 69th). Dong Guo of Victoria, BC took 3rd of 246 entries, and Mans Montgomery of ID placed 12th. Jacob Panzera of Boise beat 922 others to take first place, officially winning $33K (chops aren’t recorded in the reports). BC’s Daniel Davies cashed for a bit less in 35th, with Troy Worth (BC), Jay Keeler (BC) and Lance Dodd (WA) in 89th, 91st, and 92nd. If you want to compare Daily Deepstacks prize pools, there’s a chart. 253 players entered this event for a prize pool of nearly $250K, and $50K up top. Miltiathis Douvas of BC took 13th place for $3.7K. 661 entrants and a $345K prize pool garnered the final seven players $29K apiece, with an extra $8.5K going to first. David Simon of Idaho Falls was in the chop. Almost doubling the prize pool (plus bounties) with 165 players, Stacey Vaughn of Bend, OR, scored $4.8K in prize money for 3rd. Judith Vigoren and Jordan Batterman of Washington both cashed in this 145-entry event. 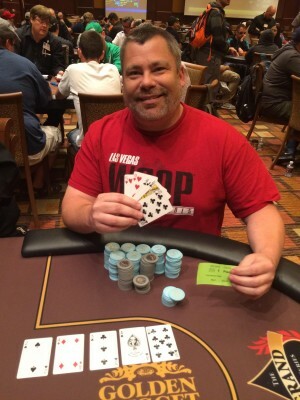 The game on 6/23 more than doubled the guarantee, and Joseph Wailor of WA made the final table for $1.35K. Floyd Bangerter of Washington took 8th place of 103 entries. The prize pool was nearly $12K. The WSOP’s $1.5K Dealer’s Choice starts this afternoon, with the $3K NLHE 6-Max kicking off at noon. Tomorrow is the $10K Ladies event (with a $9K discount for actual ladies) and the $10K PLO 8-Max. Today is the first of three Venetian flights in a $500K NLHE with a $1.6K buy-in. There’s a $300 satellite tonight. Tomorrow is a second flight for the $500K and a $300 $20K guarantee NLHE Survivor. Planet Hollywood has another busy day. It’s the first of the three flights to the $1M guarantee, a $165 satellite to the LIPS National Championship on Saturday, a $5K guarantee PLO8 game for $150, and another satellite to the $1M. Tomorrow is a $1M flight and a satellite to same. The Hollywood Poker Open at the M Resort kicks off today, with $235 satellites to the $2.5K Main Event ($500K guarantee, starting tomorrow). Starting times at 3pm, 7 pm, and a turbo at 10pm. The Grand Poker Series has the ever-popular Big O ($240) at 11am and a $350 NLHE Bounty ($100 for each knockout) at 1pm. Tomorrow is a $350 NLHE with $100K guarantee. Binion’s Poker Classic has a $550 satellite to the WSOP Main Event today with a $10K guarantee $160 NLHE game tomorrow. As one of the short stacks, Yevgeniy Timoshenko (WA) was one of the first to fall, then Auddie Reynolds (OR) went out, as the last PNW player in the match. Five players are returning for very extended play on an unscheduled Day 5. BC’s Shawn Buchanan has 533,000 chips, near the middle of the pack, as 19 players battle for the 12 paying spots in the ten-game mix. Tyler Patterson (WA) is among the 24 remaining for Day 3 of this event that drew 1,655 entries. He’ll be mixing it up with Irish pro and ultra-marathon runner Dara O’Kearney and chip leader Jason Koon at his table. Three PNW players cashed Day 2 with three others falling short of the money. OR’s Christopher Brewer was one of the subjects of an epic write-up of a hand where another player certainly appeared to be trying an angle. The field winnowed from 154 to 22, paying out about half the returning players. Dan Idema of BC is in 3rd place (former Portland resident David Tuthill is right behind him). Three players from the Northwest cashed, with Cole Jackson (WA) picking up his third of the series. There were 1,277 entrants and 327 are returning for Day 2. Eight are from the PNW, though none are in the top 100. 144 places pay. 40 players will make the money in this small field of 327. 77 players are coming back for Day 2, including two from Washington: Kent Novick and Andrew Rennhack, currently in 18th and 20th places. 87 entries, Donald Thompson (WA) made the final table for a min-cash. Portland’s Jason Luizzi took 7th out of a field of 203. Donald Martorello of Idaho made it to 16th out of 925 entries. Mark Daniel Hughes (BC) took 58th, and Steven Hartsock (OR) cashes for a second consecutive day in the Deepstacks at 94th. Pascual Iribarren taken 98th. Just for fun, I’ve posted an interactive chart of Deepstacks prize pools. I’ll keep it updated through the summer. 580 entries made for a prize pool of $116K, with the top two players chopping over $40K between them. Bonnie McCurdy of Boise got 6th place, with Seattle’s Joseph “Jammin’ Jay” Zeman in 7th. Other PNW finishers were Mark Wills (WA, 31st), Randolph Martin (BC, 37th), and John Farmer (OR, 49th). The Golden Nugget made their guarantee on this event for the first time in several weeks. As in the Seniors event, the top two players chopped for $20K each. Adam Croffut (WA) cashed in his third $100K of the series, in 8th place. John Farmer (OR) double-headed this and the Seniors event, making it to 12th. James Jacka (WA) cashed at Planet Hollywood over the weekend and takes 25th here. Jesse Hampton of Washington was the only PNW finisher in the 144-entry field, making it to 6th in the best game ever. 170 entries. Daryl Roberts of Idaho was the lone PNW player to cash, in 17th. Brent Kaiway of BC placed 4th of 90. The $1.5K PLO8 is today at noon at the WSOP. Limit Hold’em $10K is at 4pm. Tomorrow is the $3K NLHE 6-Max and $1.5K Dealer’s Choice. It’s the second (and last) flight for the Venetian $200K guarantee NLHE ($600 buy-in). Tomorrow is the first of three flights in the $500K NLHE with a $1.6K buy-in. Satellites ($300) run tonight and tomorrow night. Planet Hollywood has a busy day with a $25K guarantee NLHE 8-Max ($500); $5K guarantee $250 entry Dealers Choice, $200 NLHE Tag Team, and $200 satellite to the $1M guarantee that starts tomorrow ($1.15K entry). Tomorrow is the first of the three flights to the $1M guarantee, a $165 satellite to the LIPS National Championship on Saturday, a $5K guarantee PLO8 game for $150, and another satellite to the $1M. Aria has a $235 NLHE game at 1pm and a $150 NLHE at 7pm. The Wynn Summer Classic has $300 NLHE with $25K guarantees today through next Monday. There’s nothing today for the Hollywood Poker Open at the M Resort, but $235 satellites to the $2.5K Main Event ($500K guarantee, starting Friday) start tomorrow. The Grand Poker Series has a $240 HORSE tournament at 11, with a $150 NLHE game at 1pm. Binion’s Poker Classic is running a $220 entry NLHE 6-Max with $10K guarantee. Tomorrow is a $550 satellite to the WSOP Main Event. Results from the WSOP Daily Deepstacks are available and updated mid-day after completion of the three events ($235 at 3pm, $185 at 6pm, $135 at 10pm). I’ve been tracking the size of the prize pools, and here they are. All of the Deepstacks were cancelled on the Colossus weekend, and you can see how the pent-up energy of all those players in town pushed the prize pool of the $235 on the Monday after to over $400K. In fact, if you wanted to pick a day to make the maximum from one of the $235 events, Monday seems to be the day; with the exception of this week (after the Seniors and Super Seniors events) Monday seems to be outperforming the preceding Friday through Sunday. Check back! I’ll update the chart as soon as I get results. There are only 26 players left in the tournament at the start of Day 4, and Beaverton, Oregon’s Auddie Reynolds is near the top of the pack, starting the day with chip leader Barny “Hendon Mob” Boatman on his left. Seattle’s Yevgeniy Timoshenko—who was Day 2 chip leader is still in as one of the shorter stacks but he’ll still have nearly 20BB when they restart at 6K/12K/2K. 5 of the 8 PNW players in the first Super Seniors event made it to the money, but none of them are in the final 25 returning for Day 3. The final total of entrants to the PPC was 84. 47 are left going into Day 3, with Shawn Buchanan (BC) as the only PNW representative. Seattle’s Tyler Patterson is in the Top 10 of the 260 players returning for Day 2 of this event that drew 1,655 entries. Five other PNW players are behind him, including Dylan Linde, after busting the PPC. WA’s Cole Jackson (born in Portland!) is in the Top 10 starting Day 2 as he looks for his next WSOP cash, after just missing out on a bracelet in Event #22. Dan Idema (BC), Kevin MacPhee (ID), and Scott Eskanazi (WA) are among the 154 players returning; about half make the money. Reports from the Deepstacks aren’t usually posted by the time I do the report, so these reports will run a day behind most of the time. This event got 263 entries for a prize pool of $38K. Steven Hartsock (OR) placed 14th, Kit Jackson (ID) got 20th. 1,039 entries and a prize pool of $197K. Mark Bonsack (WA) takes first place for $36.5K. Laurie Swaney (WA) gets 20th, Charles mast (OR) is 24th. Portland’s Gavin Smith places 48th. Duck-sin Jong (BC), Mathew Henderson (OR), Gary Swaney (WA), Judith Vigoren (WA), John Scott (ID), and Michael Chittick (WA) all placed. $137K in the prize pool for this one. Daniel Price and David Price (both WA) placed 21st and 30th. Philippe Olbrechts and Rick Whitesell took 37th and 39th in this event. Today’s the beginning of a $2.5K NLHE at the WSOP, with the $1.5K Stud this evening. $1.5K PLO8 tomorrow, with the $10K Limit Hold’em later. The Venetian has a $200K guarantee $600 buy-in event with starting days today and tomorrow. Their $600 Big O tournament, $40K guarantee is this evening. Tomorrow is the second flight of the $200K and a satellite to the $1.6K NLHE, $500K guarantee starting Thursday. Planet Hollywood‘s evening game is a $5K NLHE Turbo for $130 (registration for today’s HU game is closed). Two more flights for the $100K guarantee ($300 buy-in) run today. Tomorrow has a smorgasbord of tournaments: $25K guarantee NLHE 8-Max ($500); $5K guarantee $250 entry Dealers Choice, $200 NLHE Tag Team, and $200 satellite to the $1M guarantee that starts Thursday ($1.15K entry). Aria has a $235 PLO game at 1pm. Tonight is the usual $150 NLHE. Tomorrow is back to NLHE at 1pm. The Grand Poker Series has a $350 PLO8 game this morning at 11. $150 NLHE at 1pm. Tomorrow’s morning game is a $240 HORSE tournament, with the same NLHE at 1pm. Binion’s Poker Classic has a $10K guarantee NLHE for $160 entry. Tomorrow is a $220 entry NLHE 6-Max with $10K guarantee. The remaining PNW players cashed on Day 3. None made it through to the final table on Day 4. About 80 players cashed on Day 2, with 6 from Washington and British Columbia among them. Another 8 PNW players (115 total)—with Seattle’s Yevgeniy Timoshenko leading everyone in 1st place—are coming back for Day 3. That includes Portland-area players Auddie Reynolds (19th) and John (insert Die Hard joke here) McClain in 27th. Nearly a half million up top. Just 8 PNW players in the 253 coming back from Day 1’s field of 65-and-older entrants. As you might expect, play is incredibly tight, and that combined with this years’ increase in starting stacks, a third of the returning players won’t make the money (in most previous years’ $1Ks, the money bubble burst near the end of Day 1). Four PNW-based players are in Day 2, with 73 (of an unofficial entrant count of 77) remaining. Registration is open until the restart at 2PM Vegas time. This is a 10-game mix competition. Dylan Linde of ID is in 25th place, Shawn Buchanan (BC) is 33rd, with Scott Clements and Tommy Hang of WA at 68th and 69th. There’s a $1.5K NLHE tournament at the WSOP, with the $3K PLO 6-Max this afternoon. Tomorrow is a $2.5K NLHE and $1,5K Stud. The Venetian has the second entry day for their $200K guarantee $600 buy-in Seniors event. The evening brings a $30K guarantee $400 entry bounty tournament. Planet Hollywood‘s evening game is a $5K NLHE Turbo for $130. There are two flights for a $100K guarantee ($300 buy-in). Two more flights for the $100K on Tuesday, with Day 2 on Wednesday. Aria is back on their regular schedule of $235 NLHE at 1pm and $150 NLHE at 7pm. They do have a $235 PLO tournament switched in forTuesday. The Wynn Summer Classic runs a $300 buy-in $25K guarantee. You can play HORSE at Grand Poker Series for $560 or the 1pm NLHE $350 bounty tournament. Tomorrow is PLO8 ($350) and a $150 NLHE. Binion’s Poker Classic has a $220 Ladies event today, with a $10K, $160 NLHE event tomorrow.